snowdeal.org > ex machina: yeow! the really red hot chili peppers! yeow! the really red hot chili peppers! phew. 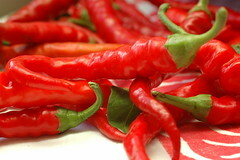 the habaneros aren't quite ready for harvest, but the cayenne peppers are ripe for picking and, whoooweee, they are hot! there's plent-o 8-methyl-N-vanillyl-6-nonenamide in them thar peppers.